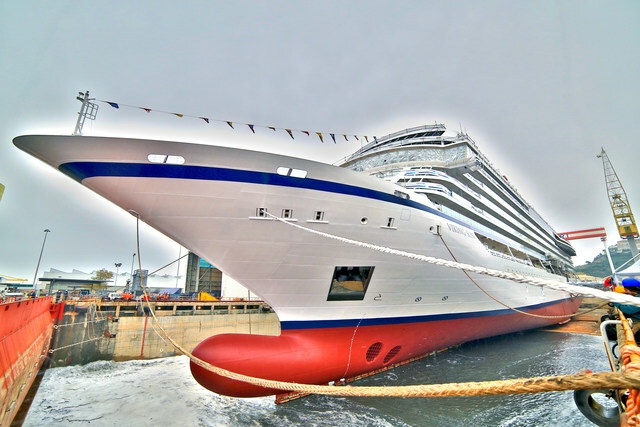 Viking Ocean Cruises fourth cruise ship has been floated out at the Fincantieri’s Ancona shipyard in Italy. The float out marks a major construction milestone as the luxury vessel is now well on the way towards completion. A ceremony was held to celebrate the traditional event on Thursday where cruise line and shipyard officials attended. The float out began in the morning and not long after it touched water for the very first time. In keeping with maritime tradition, a madrina – a special woman of honor – assisted with the ceremony, first welding coins under the ship mast. Mrs. Yi Lou, Vice President of China Merchant Bank Financial Leasing (CMBFL), served as Viking Sun’s madrina. Mrs. Lou then cut a cord to allow water to begin flowing into the ship’s building dock. The Viking Sun moved to another sock where the fitting out phase will begin. This is when all the interior spaces will start to come together. Viking Sun will debut in late 2017 and will be marketed to travelers in North America, the U.K., Australia and New Zealand. The ship will begin her maiden season sailing voyages to Cuba and the Caribbean, before embarking on a 141-day World Cruise that spans 5 continents, 35 countries and 66 ports. The luxury ship will be 47,800 tons with 465 cabins and accommodate 930 passengers.